1.) Preheat the oven to 150°C, gas mark 2. Heat the cream and the goat’s cheese in a saucepan until the cheese has melted then simmer until fully combined. Leave to cool until just warm. 2.) Whisk the eggs in a bowl and then add half the goat’s cheese mixture and whisk together. Pour back into the remaining goat’s cheese mixture and whisk together. Season to taste. 3.) Pour into a medium (about 20-22cm square) ovenproof dish lined with clingfilm and sprinkle with the grated Parmigiano Reggiano. Stand the dish in a roasting tin and fill with boiling water to halfway up the sides of the dish. Bake for 25-30 minutes. Leave to cool and then cover with clingfilm and chill in the fridge. 1.) Put 500ml of the pineapple juice with the sugar into a saucepan and boil until reduced by half (to about 250ml). Add the soaked gelatine to the pan and stir until dissolved. Stir in the remaining pineapple juice then leave in the fridge for about 2 hours until set. 2.) Remove from the fridge and transfer to a bowl. Whisk with an electric whisk until light and fluffy. Put into a 23 x 16cm deep baking tray and return to the fridge for at least 2 hours until reset. 1.) Preheat the oven to 180°C, gas mark 4. Cook the spaghetti in a saucepan of boiling salted water for 5 minutes. 2.) Drain, refresh in ice-cold water, drain again and pat dry. Spread out in straight lines on a baking tray and bake for 8 minutes. Season to taste with salt. 3.) Preheat the oven to 90°C, gas mark ¼. Place the pineapple on a lightly greased baking tray and sprinkle with salt, black pepper and sugar to taste. Bake for 3 hours or until crispy. Turn the goat’s cheese out of the tray, cut into 3cm squares and put two squares on each serving plate. 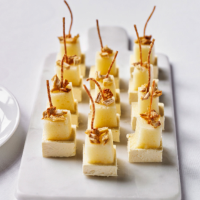 Cut the pineapple marshmallow into 2cm squares and place a cube on top of each square of goat’s cheese. Skewer the cheese and pineapple with the oven-dried spaghetti. Sprinkle with the dried pineapple.